You know that fixed or vacant expression someone gets when they seem to be staring off into space…I did a lot of that very thing recently. We were on vacation, and the thing I was staring at was a lake. 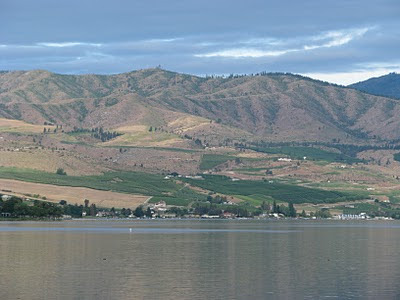 We have been going to Lake Chelan for over twenty-five years at various times of the year and we never seem to tire of staring at that darn lake. Before I know it, I have spent thirty minutes or more just staring at water. My husband, Dennis, and I even discuss the lake gazing and have decided there is something special about this lake. This is where we come to “do nothing” year after year. After a few minutes of lake gazing, my mind is literally blank, void of any thought whatsoever. The other day I spent over an hour just staring. When I finally surfaced, my face broke into a slow smile. “Ah”⎯what a wonderful thing to be able to do. We were all told when we were young, “It’s not polite to stare!” Frankly, if someone were staring at me it would make me a bit uncomfortable, especially after an hour! When I was in school I remember a teacher saying, “Earth to Michelle, where are you?” Needless to say, I was embarrassed and accused of daydreaming. As an adult, I understand that it may be rude in some circumstances to stare and not a good idea to daydream if you should be paying attention to something else. But perhaps we all could benefit from a bit of “selective” staring. I find my breath slows and becomes very shallow⎯the same feeling I experience when I begin waking from a deep sleep. I feel extremely relaxed and peace-filled afterwards. I experience newfound energy and clarity. Don’t Wait Until You Are Sick!! !